Stuck in a workout rut only aerial acrobatics can cure? You're in luck! See, you can’t just leave a baby in its car seat in the corner of a yoga studio while you take a 90-minute class. They don’t like that. And a crying, car-seat baby does not a Zen yoga class make. It was ex-nay for the oga-yay. 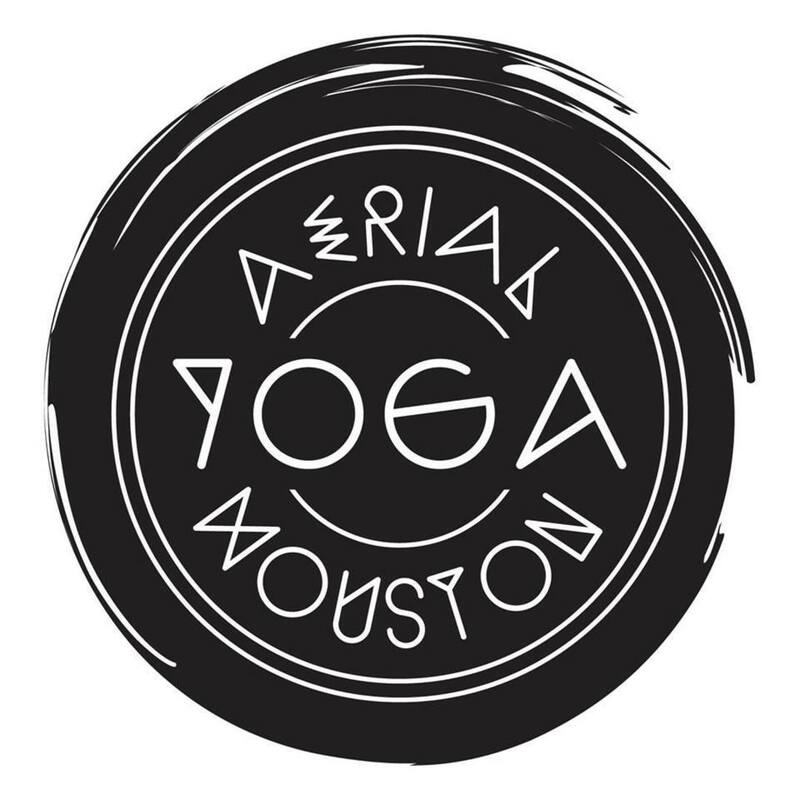 Fast-forward two years, in which time I’ve taken exactly two classes, and there’s a new studio in town called Aerial Yoga Houston offering classes to yogis of all skill level. Sign me up! What could go wrong? 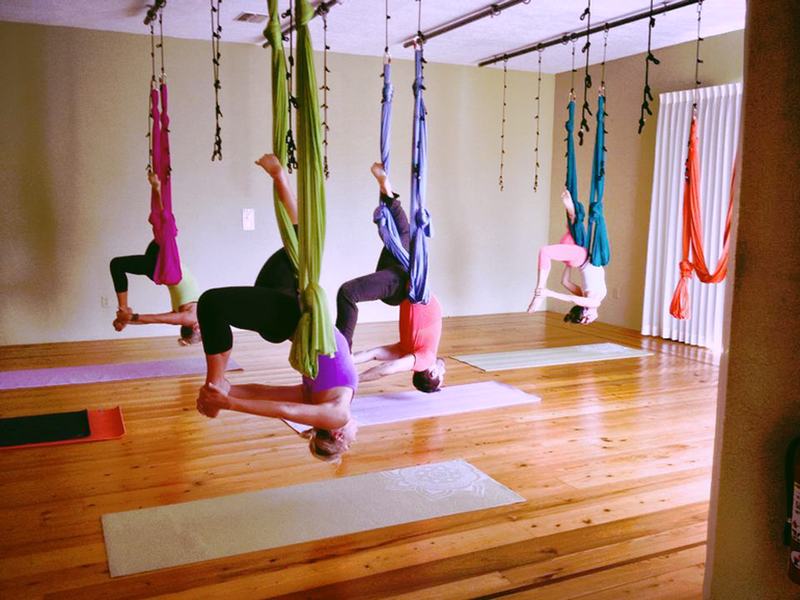 Although aerial yoga may sound intimidating, it is surprisingly gentle. The silks provide great support for beginners and can facilitate deeper stretches for more advanced yogis. 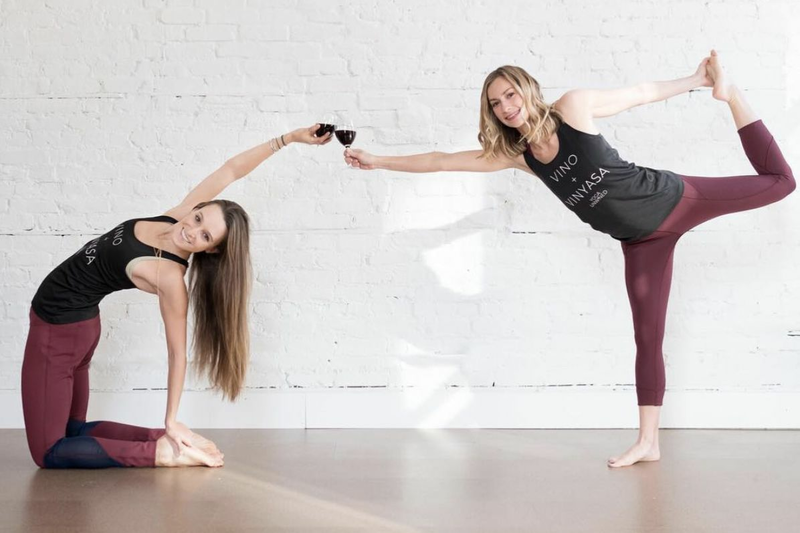 Aerial Yoga Houston founder Nicole Haagenson took us through an introductory class, which begins with 20 minutes of strengthening (think knee tucks, planks, and pikes). Your core will definitely feel it, and, just so you know, this was the most challenging part of the class for me. The next twenty minutes are for stretching, which is great with the silks. Being severely out of practice, I used mine for extra support, but I still felt the lengthening effect of each stretch. Honestly, I walked out of class feeling long and lean, which, if you’ve ever seen all 62 inches of me, are not the first two adjectives that would come to mind when describing my physique. The final twenty minutes are where the fun stuff happens. As the studio tagline states, “Strenthen. Stretch. Fly.” Don’t get me wrong, a lot of the "flying" poses take a bit of faith to get into (Me: “Wait, you want me to bend over, taking my feet off the ground, even though my hands aren’t touching?”), but with that faith comes a whole lot of fun. It is aerial acrobatics! Granted, I couldn’t see myself getting into and out of the poses, but based on how I felt, I’m pretty confident Cirque du Soliel would be impressed. 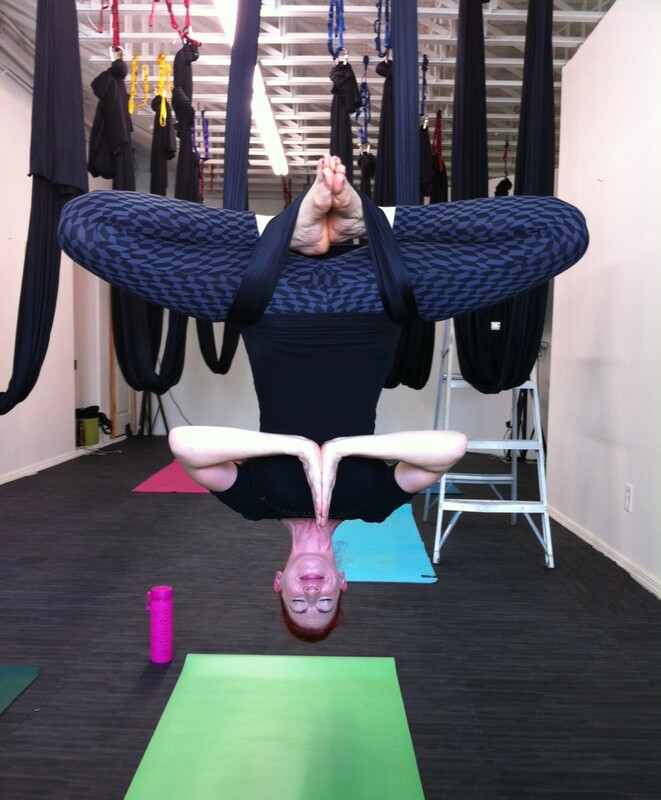 After class, I took a minute to chat with Haagenson, who has been a yoga instructor for the past 15 years and began doing aerial yoga in 2010, and she reminded me that though the tricks are fun, there are a whole lot of benefits that go with them. First, the inversions decompress the spine, no doubt adding to that long, lean feeling I walked out with. Also, reversing blood flow helps fight fatigue and improves circulation. Inversions are especially helpful to those suffering from anxiety or depression. There's also a mental clarity that comes with inversions. 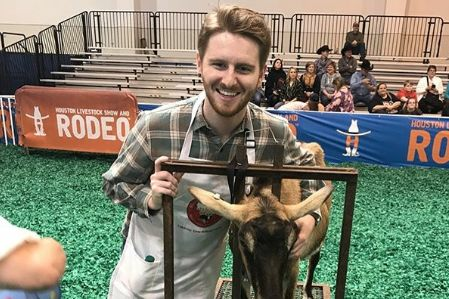 As Haagenson says, "Inversions help you go on a mental vacation. Your body releases dopamine. There's an actual chemical reaction that occurs, and there's a metaphysical shift." Some students, she says, have even reported experiencing a "high" for as long as 24 hours after class. While I'm not sure aerial yoga will replace every yogi's mat practice, it is a great way to mix it up and stay excited about exercise. 1. You must wear a shirt with sleeves. While a t-shirt is fine if you don't mind flashing your abs, a tight-fitting shirt works best. I wore a yoga tank with a thin shirt over it, and everything stayed in place. 2. If you have a tendency toward motion sickness, be wary. 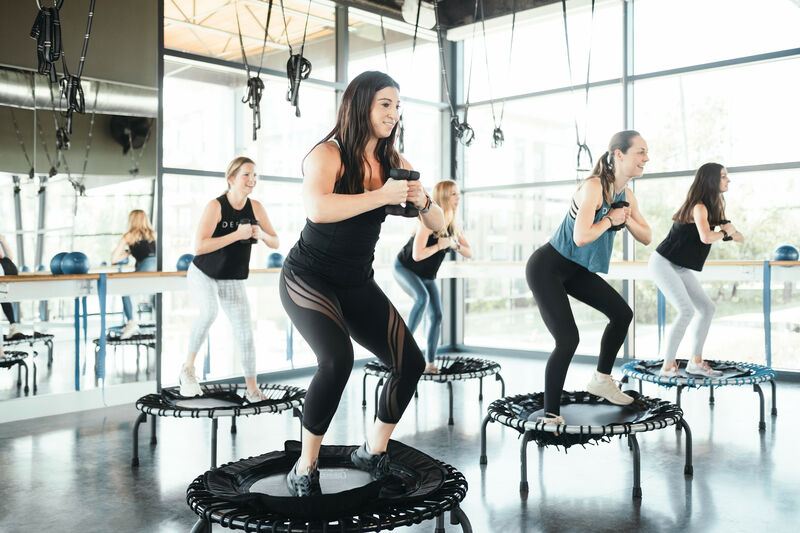 I struggle mightily with motion sickness, and I found myself fighting off a mild queazyness at different points throughout the workout. It's nothing most wouldn't be able to work through, though. 3. The studio is hidden. You know that lot with the gigantic president busts, adjacent from the Target on Sawyer? It's in that warehouse at the end of the block. You'll go up the stairs at the far west end of the building, and then you'll start seeing the studio signs. The studio will be under construction for the next few weeks (yay, improvements! ), so you'll have to follow more signs through the building to find to the temporary space, but once you do, you'll be happy to did.